What is “street photography”? How is street photography defined? Should it be defined? Who, if any, has the authority to define and maintain the definition? I presently subscribe to Eric Kim’s definition, but it’s important for people to photograph as they wish and desire. Whatever people think in terms of their streets is entirely up to them. When I returned to my hometown for an extended period, I returned to the streets to became familiar with them again. Street names have remained unchanged for the most part, although many buildings have long since been demolished and replaced by something else. When I first picked up a camera, I rarely turned the lens onto people. It’s been a slow evolving process to shift my camera onto scenes with people. With that in mind, I’m fortunate to have some shots with people in decent scenes mixed with good timing. “Faithful.” Strathcona – 28 Feb 2013. I returned briefly to Vancouver after completing my year-long around-the-world trip. During a short walk through my neighbourhood, this corner café used to be one of many “corner” grocery stores where I’d sneak my allowance for a candy bar (or two or three). Naturally, Strathcona and its demographic have changed over the two decades I’ve been away. But one fact remains: dogs do civilize the place, don’t they? “Alma mater.” Burnaby Mountain – 27 Feb 2013. I spent five years on the main campus of Simon Fraser University. First came engineering; then came physics, along with several work semesters in the co-operative education program. Even among thousands of students, there’s quiet to be found on the summit of Burnaby Mountain; this image of the reflecting pond at the Quad1 will always be a little piece of time travel. 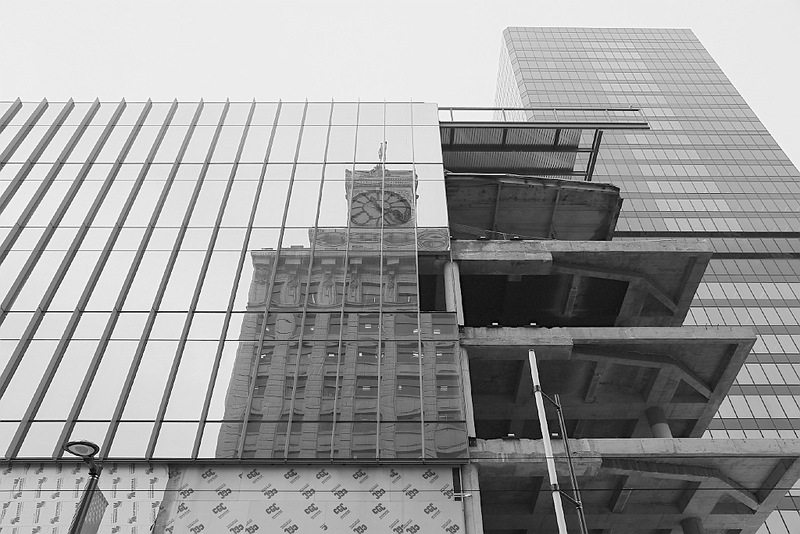 “Rebirth.” Vancouver Block reflected in new home of Nordstrom/Microsoft, downtown/CBD – 17 Jan 2014. There’s a bus stop at the southeast corner of Granville at West Georgia in Vancouver’s downtown (CBD2). Like many, I’ve spent a lot of time here waiting for the bus to arrive. There’s change, as the old Eaton’s became Sears, and construction will soon give way to the home of Seattle’s Nordstrom and Microsoft. And then there’s history, and that’s where the Vancouver Block enters the picture. “I see flakes.” Chinatown Plaza – 23 Feb 2014. “Chinatown neon” – 31 Jul 2014. I have many childhood memories of neon lights in the city’s downtown and Chinatown districts. 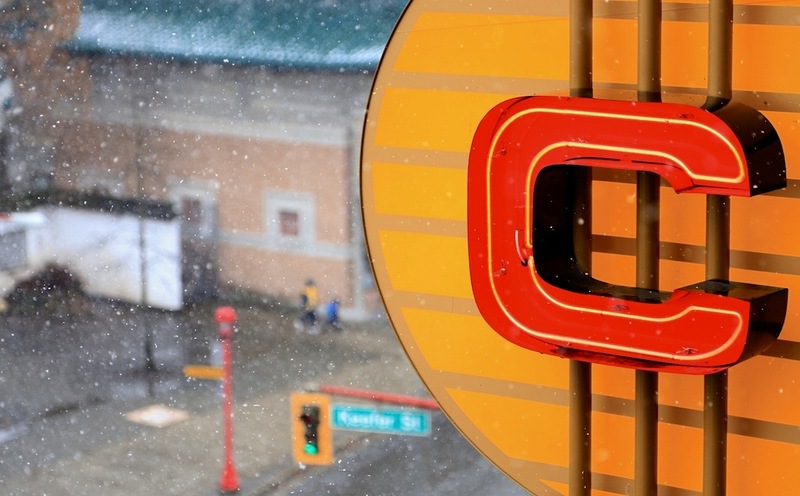 As neon signs have disappeared, one sign for Chinatown Plaza stands tall at the corner of Keefer and Columbia. The red and yellow are not only easily recognizable, but their “warmth” is as familiar to anyone who knows about Chinese culture. “Morning flight.” Strathcona – 23 Mar 2014. Not all Chinese have escaped Strathcona for the suburbs. The evidence is plain for all to see on clear mornings as senior citizens gather at the local park (“my park of childhood”) for their daily “tai chi.” Watching their deliberate motions reminds me that one day they’ll all soar to great heights, as my own father finally took flight in August 2014. “Dundarave morning.” West Vancouver – 1 May 2014. West Vancouver was always a mystery to us on the “East Side.” To us, the affluence, the fancy cars, and the Britishness of it all were as tangible as the aether. Even with years in between, I’ve come to Dundarave, and the mystery remains. I don’t know what prompted me to lift the camera and make this shot; there’s something about the person standing tall and hand firmly on their cane, about to cross 24th Street with the light. “Corner freeze.” Downtown/CBD – 22 May 2014. I lucked out, because I managed to frame the shot with the appropriate depth of field. With the “bracket” provided by the person’s shoulder in the foreground, we see a variety of people in the background, waiting to cross Robson Street. I like the mix of residents, shoppers, tourists, singles, and couples. “Duel.” Gastown/CBD – 28 Jun 2014. This scene simply begged to be photographed. 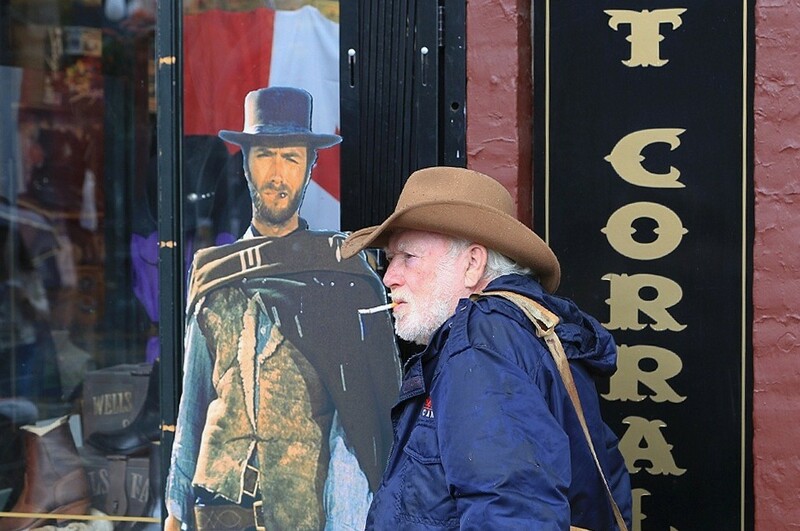 On a walking tour of the city’s historical Gastown, I had to be quick with the camera before another person crept into the field of view, or this fine white-bearded gentleman in a blue coat moved away from the Clint Eastwood cardboard cutout (“The Good, the Bad, and the Ugly”). “Drive by, by day.” Downtown/CBD – 2 Aug 2014. “Two bikes, at night.” Downtown/CBD – 8 Aug 2014. There is a span of three weeks in the summer of 2014 which will not be easily forgotten. Every day, I visited my father in St. Paul’s Hospital, a place from which in his dying state he would not return. Living a life means a measure of self-control, and watching life slip away also means a loss of control. For me, these pictures of timing are a reenactment and momentary realization of control. “Solter(r)a.” Chinatown – 23 Aug 2014. “Solterra” is a Spanish compound word consisting of “sol” (sun) and “terra” (earth or ground). “Soltera” is the Spanish noun for a single unmarried woman. There’s delicious irony and paradox, and even a possible parable for local residents (yay) and developers (boo). I wrote more here and here. 1 Quad or AQ, for Academic Quadrangle. 2 CBD, for Central Business District. I made all of the above photos in Vancouver, BC, Canada, from 2013 to 2014 inclusive. I made the cover/featured shot on 18 June 2013. I used a Canon 450D until its demise in August 2013; since then, I’ve been using a Canon 6D. This post appears on Fotoeins Fotopress at fotoeins.com as http://wp.me/p1BIdT-8RB. Great piece on your recent musings – Love the solterra shot.